Supreme Court Justice Ruth Bader Ginsburg said on Sunday that she thinks she has at least five more years on the Supreme Court. "I'm now 85. My senior colleague, Justice John Paul Stevens, he stepped down when he was 90, so think I have about at least five more years," Ginsburg said following a production of "The Originalist," a play about the late Justice Antonin Scalia, at a theater in New York. Ginsburg spoke about her late colleague and said Scalia was her favorite dissenter when she was writing for the court because it would help her form her arguments. 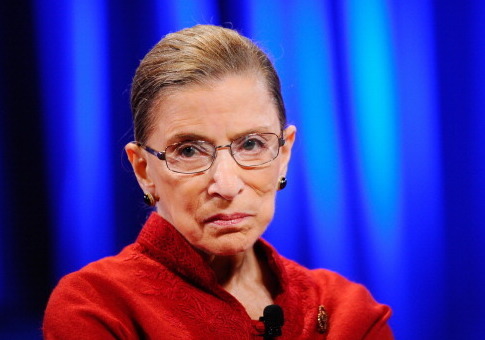 "If I had my choice of dissenters when I was writing for the court, it would be Justice Scalia," Ginsburg said. "Sometimes it was like a ping-pong game." Ginsburg is the oldest justice on the court and will be the only justice in her eighties when her colleague Justice Anthony Kennedy retires on July 31. CNN reports Ginsburg has hired law clerks for the next two terms, a signal that she plans to stay on the court until after the 2020 election so there could be a possibility of Democratic president picking her replacement. "The Originalist" Director Molly Smith asked Ginsburg what keeps her "hopeful." She answered that her husband Marty did. "My dear spouse would say that the true symbol of the United States is not the bald eagle — it is the pendulum," Ginsburg said. "And when it goes very far in one direction you can count on its swinging back." When asked about the possibility of term limits for Supreme Court justices, Ginsburg said there was no chance. "You can't set term limits, because to do that you'd have to amend the Constitution," Ginsburg said before adding that one of the few ways to remove a judge is for bad behavior. "And most judges are very well behaved," she joked.